Although not mentioned in the Tarikh, it is maintained by some sources including Buraara Koi, that Utheem kateeb Mohamed Thakurufan was the great-grandson of Kalu Hassan Kaleyge of Baararh in Thiladummathi Atoll. Buraara states that Kalu Hassan Kaleyge was of Hilaaly descent and that he was a contemporary of the Hilaaly King Siri Bavana Sooja (Abubakur I). This meant that he was related to the ruling dynasty in Malé. Certainly, while the vast majority of the Malé population abandoned King Audha Siyaaka Katthiri (Ali VI), a non-Hilaaly, to the mercy of the forces of their Christian King who was a Hilaaly, they had no difficulty in accepting the leadership of a minor provincial official. The reason, according to these sources, was that he was no ordinary run-of-the mill kateeb. He was a member of the Hilaaly family that still commanded immense prestige all over the Maldives. There is ample evidence in the oral tradition as related by Buraara, that the prestige and power enjoyed by the Thakurufans of Utheem were far beyond those of mere provincial officials. The following are some of the evidence. The following are some of the points taken from Buraara. The Thakurufans of Utheem seem to take precedence of order over the Viyazor, Andiri Andirin�s atoluverin in Baararh, the administrative capital of the four atolls to the North of Malé. For example when the atoluverin visited their residence in Utheem, his hosts did not stand up to receive him and was always offered the bodu-arhi and his hosts sat on the kuda-arhi. On the other hand when the Utheem Thakurufans called at the residence of the atoluverin, he always stood up to receive them and offered them the kuda-arhi. To the chagrin of officials in Malé, Andiri Andirin ordered the poll tax from the island of Utheem to be waived, as soon as he assumed the regency. In the traditional Maldive domestic reception room, there were three platforms. Looking from the outside door, along the right wall was the bodu-arhi, about 50 centimetres high. Along part of the left wall was the kuda-arhi, also about 50 centimetres high. Both had built-in storage under them and were overlaid with fine mats and squabs. Across on the far wall was a lower platform called the tiri-arhi, also overlaid with mats. 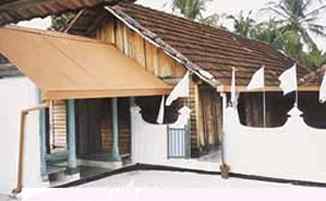 On top of the tiri-arhi was a couch called dimaa-endu overlaid with a thick mattress, squabs., pillows and printed linen sheets. Between the tiri-arhi and the kuda-arhi were a table and a chair. The place of most honour was the dimaa-endu, which was seldom used, followed by the kuda-arhi and then the bodu-arhi. The Viyazor atoluverin was under strict orders from Andiri Andirin to entertain all requests of the Thakurufan brothers. Soon after Mohamed Thakurufan married Sitti Maavaa Rani Kilegefan he and his brothers were banned from entering Malé, even though their other privileges were not curtailed. The Viyazor atoluverin was married to Kambaa Aysha Rani Kilegefan, widow of King Audha Siyaaka Katthiri (Ali VI), aunt of King Manoel, and daughter of King Siri Dhammaru Bavana (Mohamed the Black) and Burecca. Sitti Maavaa Rani Kilegefan was her daughter from Ali VI. The ban from Malé was unlikely to be related to the fact that Mohamed Thakurufan was married to a daughter of the vanquished sultan. Andiri Andirin did not regard as threats, King Ali�s son and two daughters from a commoner, who continued to live in Malé. Sultan Ali was not a Hilaaly. Although the realm was governed in the name of Manoel, who was a Hilaaly, the Utheem Thakurufans who were also Hilaalys were regarded as contenders to the throne and a threat to the security of the realm. It was unlikely that simple kateebs of far-flung islands would have been regarded as threats to the security of the realm. While there were hardly any Moslems left in many of the neighbouring islands, no attempt was made to evangelise in Utheem When the Utheem Thakurufans called on their father�s uncle, the Eduru Kaleygefan of Nolivaranfaru, the latter always told them to keep their voices down, as he and his wife were the only Moslems left on the island. Prior to the Utheem brothers taking up arms against the regime in Malé, Thuffarhanaa Thakuru, son of Andiri Andirin�s treasurer Midu Thakuru, petitioned for the heads of Mohamed Thakurufan and his brother Hassan. Andiri Andirin ignored the petition for over a year before granting it. Clearly those in power in Malé regarded the Utheem Thakurufans as a real threat. Long before his marriage to Sitti Maavaa Rani Kilegefan, Mohamed Thakurufan and many others believed that he had a right to the throne in Malé. His first marriage was to Rehendiya Goyye, daughter of Cat Fatima of Borhi Forest, a woman of immensely humble means from Baararh. On the night of the wedding, which took place in the woods of Baararh in secrecy, Rehendiya Goyye supposedly gave seven leaves of the betel vine to Mohamed Thakurufan, twelve leaves to the chief witness and thirteen leaves to the second witness. Mohamed Thakurufan commented to the witnesses that Rehendiya Goyye was making a statement with the numbers of leaves. Thirteen stood for thirteen thousand islands, the legendary number of islands in the Maldives. Twelve stood for twelve atolls and seven stood for the royal parasol � a symbol of the Maldive sovereigns in the same way as the crown is the symbol of the monarch in many other countries. Those who fought to succeed the Christian Hilaalys to the throne of the Maldives were indeed Hilaalys themselves and were regarded by many as the rightful heirs to the throne, when the line of King Siri Dhirikusa Loka (Hassan IX later Manoel) became Christians. According to the Tarikh, Mohamed Thakurufan ascended the throne soon after capturing Malé. Buraara is significantly more ambiguous on the subject. He concedes that the Thakurufan did not ascend the throne upon capturing Malé, but did so soon afterwards. Subsequently Buraara states that Mohamed Thakurufan assumed the title of Sultan one year and a month and twenty eight days before his death, The Tarikh records the Anno Hegirae equivalents of AD 1585 as the year of his death and AD 1573 as the year of his capture of Malé. The discrepancy is significant because, if he indeed ascended the throne, he relinquished the title of Sultan subsequently under pressure from the Christian Hilaalys in Goa. The more likely scenario is that under a pact between the Christian Hilaalys the Thakurufan and his two immediate successors never were installed sultans. The documents given under the seal of Mohamed Thakurufan refer to him as minister. As Buraara states so precisely, he may have reassumed the title of Sultan just over a year before his death, in violation of the pact with the Christian Hilaalys. Mohamed Thakurufan's son Ibrahim whose long reign ended when a marauding band of men sent by the Ali Raja of Cannanore sacked Malé. Mohamed Thakurufan captured Male with the aid of the Ali Raja of Cannanore with the promise of several islands there to the Ali Raja. Soon after the conquest Mohamed Thakurufan went back on the deal and that was why it became necessary to make a pact with the Christian Hilaalys recognising them as kings of the Maldives. Ali Raja invaded male in the "reign" of Ibrahim Kalaafan to have the deal honoured. Unlike his father, Ibrahim was not warlike and fled Malé, only to be captured and killed by Ali Raja�s men. Ibrahim continued to be called "kalaafan" or Lord. This indicates that he was never installed as sultan. Indeed Mohamed Thakurufan would not have been referred as Thakurufan if he were a sultan. Thakurufan was a appellation beneath the dignity of the nobility and royalty. He would have dropped that appellation upon assumption of the throne as did several other sultans. Kalu Kamana daughter of Hassan Thakurufan and niece of Mohamed Thakurufan may have succeeded Sultan Ibrahim. She was succeeded by Hussain Faamuladeyri Kilege, son of a daughter of Eduru Thakurufan of Baararh who was a son of Kalu Hassan Kaleyge. Hussain Faamuladeyri Kilege was Mohamed Thakurufan�s second cousin. Again, the continued use of the title of Kilege indicates that he too was not installed as sultan. Hussain Faamuladeyri Kilege was succeeded by Kalu Thukkala, son of Aminah Maavaa Kilege, daughter of Maryam Kambaadi Kilege, daughter of Ali Thakurufan, kateeb of Maarandu and elder half brother of Mohamed Thakurufan. Kalu Thukkalaa assumed the title of King Siri Kula Sundhura Katthhiri Bavana (Shuja'i Mohamed Imaduddine I). By then the Christian Hilaalys in Goa were squabbling amongst themselves over the succession. As a result, Kalu Thukkala may have found enough courage to assume the title of sultan. Shuja'i Mohamed Imaduddine I was succeed by his son King Siri Kula Ranmeeba Katthiri bavana (Iskander Ibrahim I). It was he who, in 1649, finally broke all constitutional links with the Christian Hilaalys in Goa. Iskander Ibrahim I was succeeded by his son Mohamed the Little as King Siri Mani Ranna Loka, a mere child. His mother, the allegedly nymphomaniac Princess Maryam appointed herself as Princess Regent. According to the Tarikh, she encouraged open promiscuity and lewdness among Malé�s high society during her son�s reign. Maldivian society had always been, and still is, fairly promiscuous beneath the veneer of Islamic piety. Mohamed the Little and the Princess Regent were involved in an explosion when their yacht�s magazine was hit by a spark of gunfire while they were out pleasure cruising off the island of Bandos. The Regent perished, and her son died shortly afterwards of injuries sustained during the explosion. Mohamed the Little was succeeded by Mohamed Manikfan son of Hassan Faarhanaa Kilegefan son of Shuja'i Mohamed Imaduddine I. He belonged to a sect preached by an Islamic cleric who visited Malé during the reign of Iskander Ibrahim I. This purist brand of Islam preached by the cleric became unbearable to the Malé citizenry and Iskander Ibrahim tactfully deported him. It was the fundamentalist sect of the mullah known as Abdul Cader Jeilani, a native of Jeilan in what is now Iraq. Women were required to cover up and men were required to shave their heads and moustaches and grow beards. Those who transgressed these orders were beaten by the Islamic police. Those who were found in public places during prayer times were also flogged. An age old way of life was about to be destroyed. Mohamed Manikfan assumed the title of King Siri Naakiree Sundhura (Mohamed Mohyeddine the Just). Shortly after becoming sultan Mohyeddine sent word to his mentor, the Moslem cleric, inviting him back. Three days after the arrival of the cleric the Sultan died - so ended the Utheem Dynasty, very likely a branch of the Hilaaly Dynasty. The Maldives had not heard the last of the Hilaalys. Their dynasty was restored, many years later and survived until 1968. The cleric was then proclaimed King Siri Hikaa Madhaadheettha. His name was Sayyed Mohamed Shamsuddine son of Sayyed Abdul Razzak. He was a graduate of the Seminary of Al-Azhar in Cairo and a native of the city of Hama in Syria. The strict Islamic regime imposed by this cleric as sultan stifled all aspects of life in the Maldives, particularly in Malé. Those who neglected the five-times-a-day ritual prayers were executed by decapitation. To everyone's relief he died of fever and diarrhoea within four months. The chief justice Mohamed son of Ali Tukkalaa of Devvadoo succeeded the cleric as King Siri Kula Ran Mani. When the Devvadoo King died, his pregnant wife Sanfah was poisoned and killed by her uncle in order to seize the throne. In Iyye of 10 August 1997 (pages 102 to 104), it's editor and proprietor Leggi Saalimuge Baburu Naibuge Kalu Ali Manikuge Don Manikuge Hussain Manikuge Abdul Hakeem (Abdul Hakeem Hussain Maniku) published a list of people who had "attempted to compromise the independence and sovereignty of the Maldives with foreign assistance". Abdul Hakeem is an unusually objective commentator among Maldivians and most of his writings are exceptionally accurate. However he has not given his criteria for determining those who were included in this list. Buraki Ranin (Burecca daughter of Recca daughter of King Siri Bavana Sooja) for allegedly collaborating with the Portuguese. Burecca was attempting to regain her husband's throne. King Siri Dhammaru Bavana (Kalu Mohamed, whose consort was Burecca) for allegedly collaborating with the Portuguese. Kalu Mohamed played a passive role in his consort's successful attempt to regain his throne. King Siri Dhirikusa Loka (Hassan IX later Manoel) for allegedly collaborating with the Portuguese. Manoel was attempting to regain his throne and was successful. King Siri Kula Sundhura Siyaaka Saasthura (Ibrahim Mudzhiruddine) for allegedly collaborating with the Mogal governor of Bengal. Mudzhiruddine was unsuccessful in regaining his throne. Chief Justice Mohamed Shamsuddine and his brother Kateeb Ahmed Mohyeddine for allegedly collaborating with the Ali Raja of Cannanore. These two men of law may have conceded to a legal point when they recognised a treaty concluded by Utheem Kateeb Mohamed Thakurufan with the Ali Raja. Athireegey Ibrahim Dorhimeyna Kilegefan and his son Ahmed Dorhimeyna Kilegefan for allegedly collaborating with the British. The elder Kilegefan allegedly forced King Mohamed Mueenuddine II to sign a letter seeking British protection in order to dislodge the rival Kakaagey faction from the premiership. A British gunship was in Malé Harbour with its guns trained on the island while the King signed. Velaanaagey Mohamed Didi and Eggamugey Abdullah Didi for allegedly conscripting a company of British Indians from Peshawar (they were convicted of this in a court of law). Abdullah Lutfi and Sagaru Nasir for allegedly conscripting a group of Tamil mercenaries (they were convicted of this in a court of law). The list contains many who sought to have them restored to their rightful roles in Malé. In that regard, Abdul Hakeem overlooked to include the intervention of Indian troops in Malé in 1988 and those who invited them. It is worth noting that Abdul Hakeem is the first cousin of Leggi Saalimuge Baburu Naibuge Kalu Ali Manikuge Don Manikuge Don Tuttuge Abdul Gayoom, the father of the individual who called in the Indian troops. In spite of such useful connections, Iyye was banned in the Maldives after a few days in circulation. A loophole in the censorship system was used to have it published. All copies sold were called in and buyers refunded. Copies were carefully counted by officials before being destroyed. Thanks to modern technology, duplicates were made and sent beyond the jusrisdiction of the Maldive censors.